Born in Pennsylvania on 22 October 1838, per his Pennsylvania Veteran’s Burial Index Card, or on 22 October 1836, according to his Pennsylvania Death Certificate, William Rockafellow was the son of Pennsylvania natives, Peter and Susan (Dean) Rockafellow. In 1850, William resided in Williams Township, Northampton County, Pennsylvania with his parents and siblings: George (aged 15), Samuel (aged 9) and Jacob (aged 7). In 1860, he wed Anna Fatzinger; they resided in Northampton County. On 21 January 1862, they welcomed their first child, Mary Louisa Rockafellow. William Rockafellow mustered into Company E of the 47th Regiment, Pennsylvania Volunteers on 14 January 1864. From March through May of that year, he served under the command of Captain Charles H. Yard with his fellow 47th members as part of the only Pennsylvania regiment to take part in Union General Nathaniel Banks’ Red River Campaign across Louisiana. Here, at this time and place, the 47th Pennsylvania Volunteers engaged the Confederate Army in fighting as brutal as anyone can imagine. Rushed into battle ahead of other regiments in the 2nd Division, 60 members of the 47th were cut down on 8 April during the back-and-forth volley of fire unleashed by both sides during the Battle of Sabine Cross Roads (Mansfield). The fighting waned only when darkness fell. The exhausted, but uninjured collapsed beside the gravely wounded. After midnight, the surviving Union troops withdrew to Pleasant Hill. A significant number of the 47th were killed in the Battles of Sabine Cross Roads and Pleasant Hill on these Spring daus, as well as during other battles and skirmishes in this campaign. Still others were claimed by typhoid, yellow fever, dysentery and other medical conditions experienced in Louisiana’s harsh climate. Following what some historians have called a rout by Confederates at Pleasant Hill and others have labeled a technical victory for the Union or a draw for both sides, the 47th fell back to Grand Ecore, where they resupplied and regrouped until 22 April. 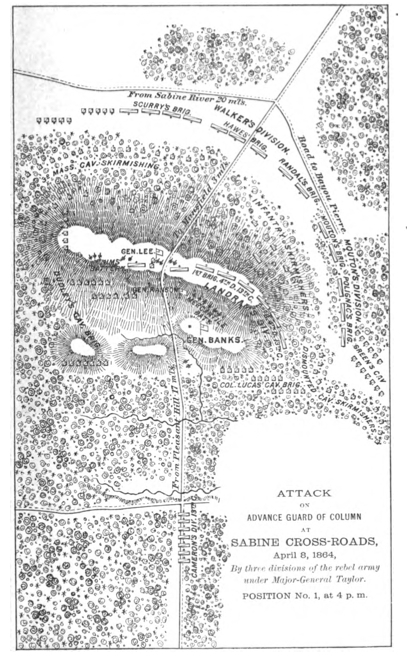 Retreating further to Alexandria, they combined with other Union soldiers again, and scored a clear victory against the Confederate forces present at Cane Hill. Known as “Bailey’s Dam” for the Union officer who ordered its construction, Lt. Col. Joseph Bailey, this timber dam built by the Union Army on the Red River in Alexandria, Louisiana in May 1864 was designed to facilitate passage of Union gunboats to and from the Mississippi River. Photo: Public domain. 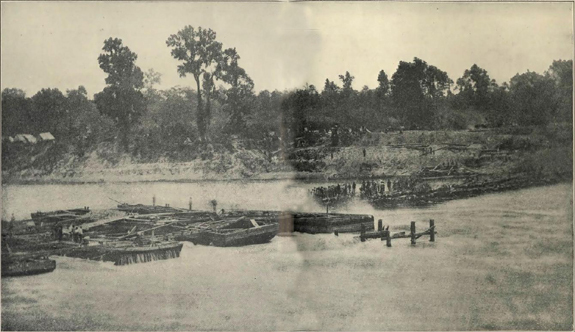 On 23 April, the 47th and their fellow brigade members crossed the Cane River via Monett’s Ferry and, under the command of Lieutenant Colonel Joseph Bailey, helped to build a dam from 30 April through 10 May, which enabled federal gunboats to successfully traverse the rapids of the Red River. Beginning 16 May 1864, Private William Rockafellow and E Company moved with the majority of the 47th from Simmsport across the Atchafalaya to Morganza, and then to New Orleans on 20 June. Still able and willing to fight after their time in Bayou country, they and their fellow 47th Pennsylvania Volunteers from Companies A, C, D, F, H, and I returned to the Washington, D.C. area aboard the McClellan beginning 7 July 1864. Following their arrival in Virginia and a memorable encounter with President Abraham Lincoln, they joined up with General David Hunter’s forces in the fighting at Snicker’s Gap, and assisted in defending Washington, D.C. while also helping to drive Confederate troops from Maryland. Attached to the Middle Military Division, Army of the Shenandoah beginning in August, early and mid-September saw the departure of several 47th Pennsylvania Volunteers who had served honorably, including Company D’s Captain Henry Woodruff and E Company’s Captain Charles H. Yard. Both mustered out at Berryville, Virginia on 18 September 1864 upon expiration of their respective three-year terms of service. Those members of the 47th who remained on duty were about to engage in their regiment’s greatest moments of valor. Moving forward, the surviving 47th Pennsylvania Volunteers would continue to distinguish themselves in battle, but would do so without two more of their respected commanders: Colonel Tilghman H. Good and Good’s second in command, Lieutenant Colonel George Alexander. Both mustered out from 23-24 September upon the expiration of their respective terms of service. Fortunately, they were replaced with leaders who were equally respected for their front line experience and temperament, including Major John Peter Shindel Gobin, formerly of the 47th’s Company C, who had been promoted up through the regimental staff to the rank of Major (and who would be promoted again on 4 November to the rank of Lieutenant Colonel and regimental commanding officer). 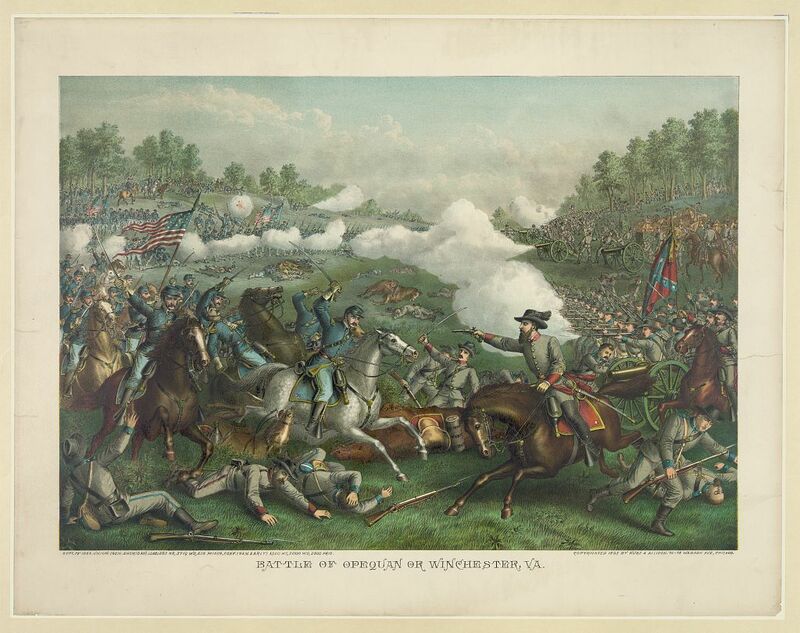 The 47th Pennsylvania suffered significant numbers of casualties with a number of men wounded or killed in the fighting in the Shenandoah Valley. Others were captured by the Confederate Army, and held as prisoners of war. Several died in captivity as POWs. Following these major engagements, the 47th was ordered to Camp Russell near Winchester from November through most of December. Rested and somewhat healed, the 47th was then ordered to outpost and railroad guard duties at Camp Fairview in Charlestown, West Virginia. Five days before Christmas they trudged through a snowstorm in order to reach their new home. Assigned in February to the Provisional Division of the 2nd Brigade of the Army of the Shenandoah, the men of the 47th moved, via Winchester and Kernstown, back to Washington, D.C. In March 1865, Private William Rockafellow was promoted to the rank of Corporal. 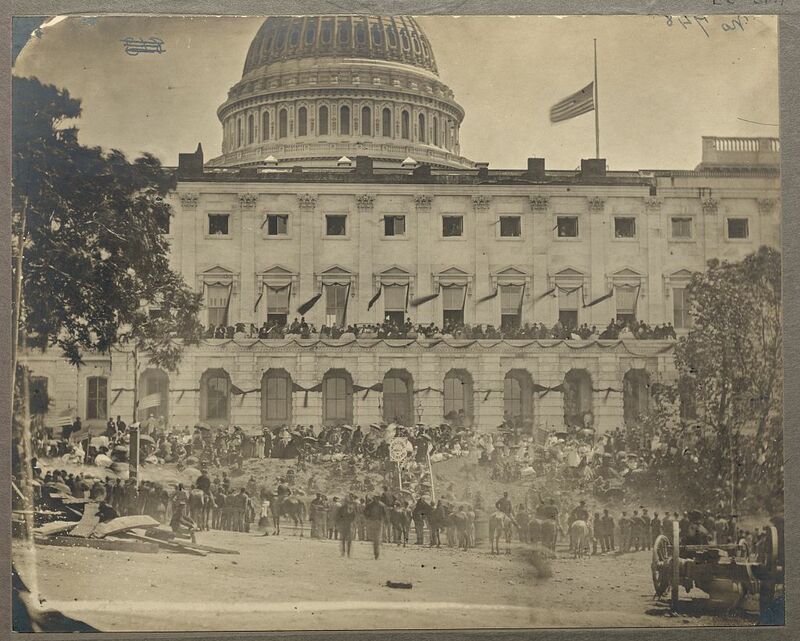 On 19 April 1864, the 47th Pennsylvania Volunteers were once again responsible for helping to defend the nation’s capital – this time following the assassination of President Abraham Lincoln. Encamped near Fort Stevens, they received new uniforms and were resupplied. Charleston, SC as seen from the Circular Church, 1865. Source: U.S. National Archives and Records Administration (111-B-4667, public domain). 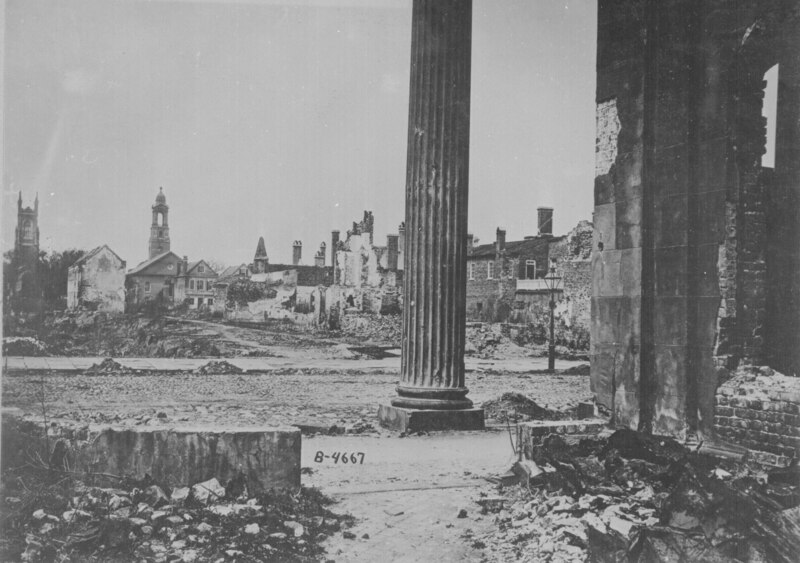 On their final southern tour, Company E and their fellow 47th Pennsylvanians served in Savannah, Georgia from 31 May to 4 June. Again in Dwight’s Division, this time they were with the 3rd Brigade, U.S. Department of the South. Taking over for the 165th New York Volunteers in July, they quartered in Charleston, South Carolina at the former mansion of the Confederate Secretary of the Treasury. On 2 June 1865, William Rockafellow was promoted to the rank of First Sergeant. Duties of the regiment typically involved Provost (military police) and Reconstruction-related tasks, including rebuilding railroads that had been damaged or destroyed during the long war. Finally, beginning on Christmas day of that year, the majority of the men of Company E, 47th Pennsylvania Volunteers, including Sergeant William Rockafellow, began to honorably muster out at Charleston, South Carolina, a process which continued through early January. Following a stormy voyage home, the 47th Pennsylvania disembarked in New York City. The weary men were then transported to Philadelphia by train where, at Camp Cadwalader on 9 January 1866, the 47th Pennsylvania Veteran Volunteers were officially given their discharge papers. Following his honorable discharge from the military in January 1866, William Rockafellow returned home to his wife and daughter, Mary, in Northampton County, Pennsylvania. By November of that same year, he and Anna had welcomed daughter Isabelle to their home. A third daughter Frances Carrell Rockafellow (also known as “Fannie”) arrived in March of 1881. But before the decade was out, the old soldier was gone. Sergeant William Rockafellow died from a heart condition in Easton at 10:30 p.m. on 14 January 1908. His daughter, Fannie Rockafellow, was the informant. Funeral services were well attended – by William’s family and by representatives of the Lafayette Post, Grand Army of the Republic. They were conducted by the Rev. Plato T. Jones from the home of the deceased at 2 p.m. on 17 January 1908. William Rockafellow was then conveyed to his resting place in plot P122 at the Easton Cemetery by pallbearers William E. Carter, J.K. and F.E. Crater, Robert A. Depue, Amos Dinkey, and William M. Semple. Note: There is another individual with a similar name (William S. Rockfellow) with slightly different birth and death dates who is also buried in this same cemetery, according to the Pennsylvania Veterans’ Burial Index Card system. 2. Death Certificate (William Rockafellow). Harrisburg: Commonwealth of Pennsylvania, Department of Vital Statistics. 3. Funeral Notice (William Rockafellow), in Easton Express. Easton: January 1908. 4. Pennsylvania Veteran’s Burial Index Card. Harrisburg: Pennsylvania Department of Military and Veterans Affairs. 6. U.S. Census (1850, 1900). 7. U.S. Civil War Pension Index (Application No. : 1261717, Certificate No. : 1026998, filed from Pennsylvania by the veteran on 28 January 1901; Application No. : 884864, Certificate No. : 643506, filed by the veteran’s widow, Anna F. Rockafellow, on 10 February 1908.